The Molecular Cytogenetics Market is projected to reach USD 2.52 Billion by 2021 at a CAGR of 10.1%. 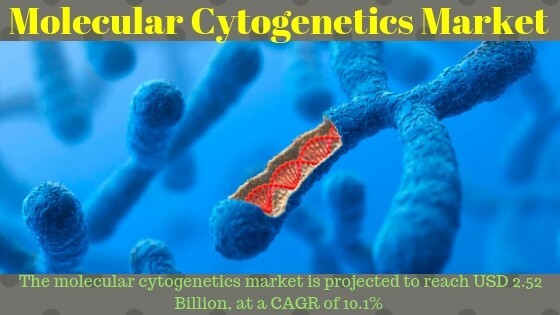 The Research Report on Molecular Cytogenetics Market, By Considering useful aspects like; Application, End Users, Product- Global Future Forecast till 2021, published by MarketsandMarkets™, the report studies the global Molecular Cytogenetics Market over the forecast period to 2021. On the basis of technique, the market is segmented into comparative genomic hybridization (CGH), fluorescence in situ hybridization (FISH), in situ hybridization (ISH), and other techniques. CGH forms the largest and fastest-growing technology segment of this market, as the increasing laboratory automation will increase areas of application of CGH in molecular cytogenetics market. Molecular Cytogenetics Market Based on application, the market is segmented into genetic disorders, cancer, personalized medicine, and other applications. The genetic disorders segment accounts for the largest share of the global market in 2016; this segment is also expected to register the highest CAGR. Owing to the large applications of molecular cytogenetics instruments, in genetic disorders diagnosis, this application will grow at a moderate rate in the future. Molecular Cytogenetics Market Based on end users, the molecular cytogenetics market is segmented into clinical and research laboratories, academic research institutes, pharmaceutical and biotechnology companies, and others. The clinical and research laboratories segment is expected to account for the largest share of the global market in 2016 and is expected to register a CAGR of 11.2% from 2016 to 2021.